On October 9th, Mobile Age had the opportunity to present tips during the European Week of Regions and Cities in Brussels. The four-day event was attended by around 6000 participants and 600 speakers from all over Europe. On Wednesday the final conference of the MobileAge project took place in Brussels. The project team presented the results of the three-year project work. Users, unfamiliar with the terminology, technical meaning or intended functionality of the (mobile) ICT may be reluctant to use current and future devices, services or applications and may miss out on potential benefits. This can hinder uptake of helpful services and prevent exploitation of their full potential. Older people and users with limited cognitive abilities may have further requirements on the information presented, to understand how to use complex technologies. Juliane Jarke and Ulrike Gerhard, Mobile Age partners from ifib, have published a paper which is based on MobileAge. The paper is included in i-com, Journal of Interactive Media. A number of older adults participated in the co-creation process of Mobile Age project and contributed to the development of the app/services. 2nd Project Press Release: just published! 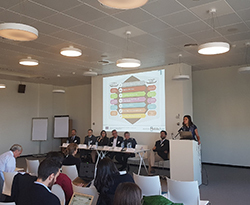 The 2nd press release of Mobile Age project is published focusing on the Mobile Age lessons learnt and tools that were presented during the Final Conference of the project which took place on October 10th in Brussels. As foreseen in the project's work plan, a number of policy briefs addressing important issues related to older adults' needs should be produced. Mobile Age Final Conference: now live in Brussels! Today Mobile Age Final Conference takes place in the Royal Library of Brussels from 10.00am to 4.30pm. The event is free of charge. Don't miss it!